Is there any easy way to find this password other than with wireshark? 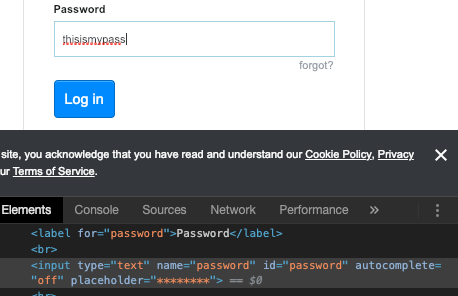 You can inspect the input element for the password and change the input type from password to text. You will notice the password that has been filled in will be visible (changed from ******). 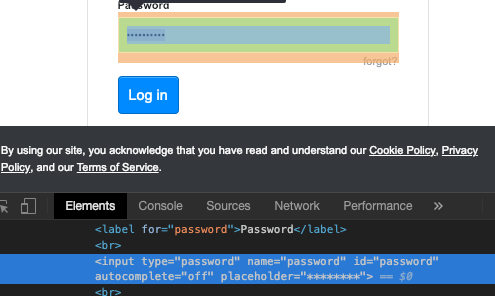 Right click on the password field on the website and click 'Inspect' from the context menu. This will open developer tools with the input element selected. It will be something like <input type="password" ..>. Change the type to text and click outside. This will save the change and you will see your password. Additionally to @abdul's answer, you can use Firefox to import from Chrome and have a backup of the passwords. You can view all your passwords in Firefox as well. Not the answer you're looking for? Browse other questions tagged macos password google-chrome . How to view saved passwords on Chrome iOS? Can I prevent Chrome from storing passwords in Keychain, instead just save it to itself? Is Chrome Just As “Safe” as Safari with Regards to Passwords? Are my safari and chrome passwords synced?